Where is your favourite unique store in Melbourne? Shopping for a rare find can be difficult but sometimes, you come across a hidden gem of a store that you want to tell everyone about because you want to buy every item in it for it's beauty and practicality. Do you have a favourite "unique" store? Where is it located and what does it sell? 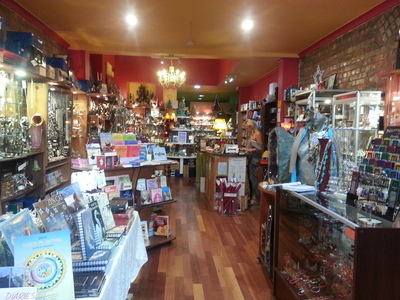 The Crystal Heart on Lygon Street, Carlton, is one of those shops where you want to pick up and buy everything you see. It's beautiful. Sisko Chocolate has artistic chocolate creations that are designed and created in the studio onside. Amazing aroma when you walk in and wonderful gift ideas as well as delicious treats for yourself. Jasper Junior is not only a cafe but a toy shop. Their most recent window display is a collection of lovely material dinosaurs - wonderfully playful and unique. Best place to buy cupcakes in Melbourne? Are you involved in the City Council in your area? Been to regional Victoria on V-line? Been to the Ian Potter Foundation's Children's Garden? Do you find hook turns in Melbourne tricky or easy? How do you find out about sales? Have you ever locked yourself out of your car?